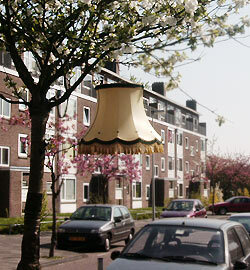 Detail of Domestic Self-Surveillance on Bernhardstraat, Leiden, 2003. 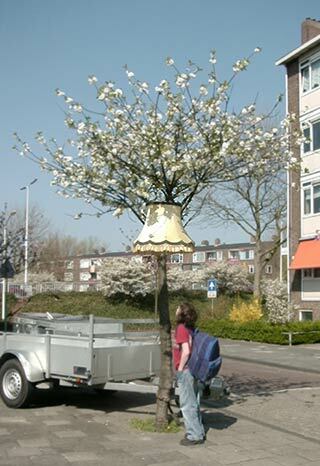 Made for the MoDA Outsized show at the Museum of Design and Architecture in London, it is a large old lampshade suspended from a tree branch. 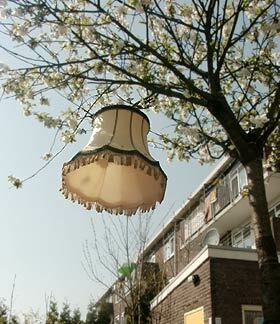 If you look up into the lampshade, you see yourself reflected. The mirror reflects back on the viewer to create a space for 'reflection' as well as creating the sense of being watched. 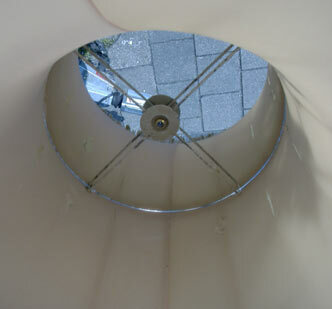 If you stand directly underneath you can see light through the tiny lens in the centre of the mirror. Detail of Domestic Self-Surveillance, 2003. Museum of Design and Architecture, Middlesex University, Cat Hill Barnet, London, U.K.